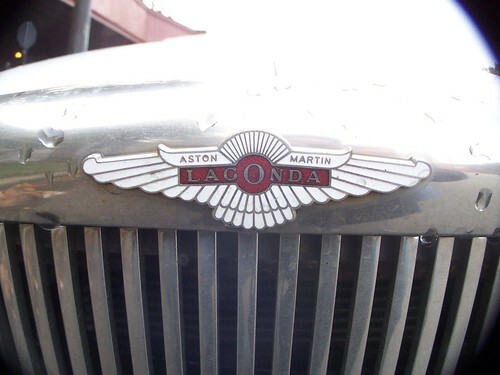 The story of ... Lagonda! 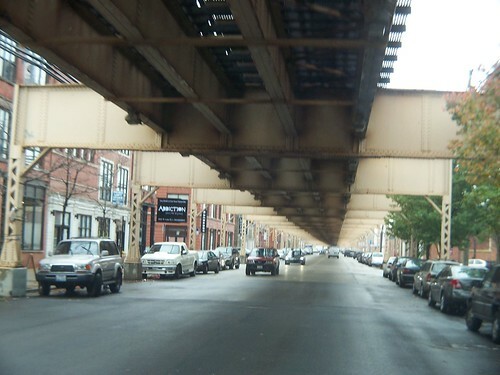 After leaving the scoot shop we meandered back towards the Loop taking in some Chicago-y sites. 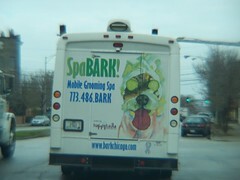 Not many places on earth will you spy a mobile dog spa and a grain elevator at the same moment (a few blocks from Oprah's studio, no less). 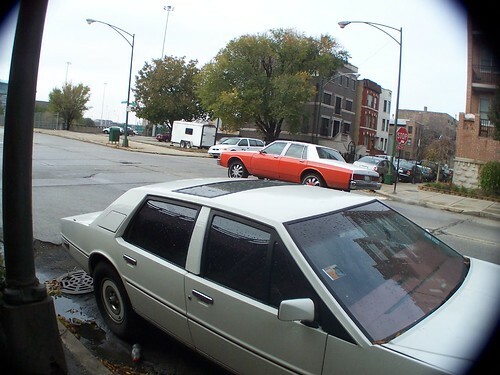 Anyhoo, when we got back over the Kennedy expressway we happily stumbled upon one of those you-don't-see-that-every-day car spotting moments: an Aston Martin Lagonda, vintage approximately 1980, parked along the residents-only street of a condo neighborhood. 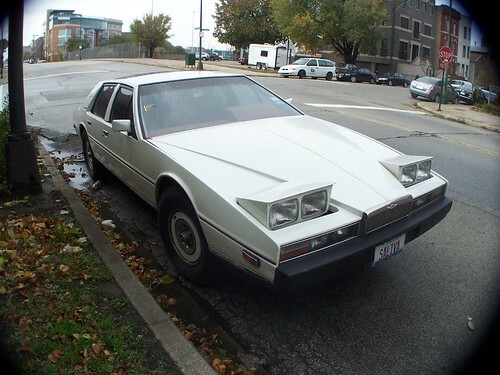 At the time of their manufacture these babies were among the most expensive cars made, with advanced (Atari-level) electronic gizmos and wedge styling that screams "Roger Moore IS James Bond." 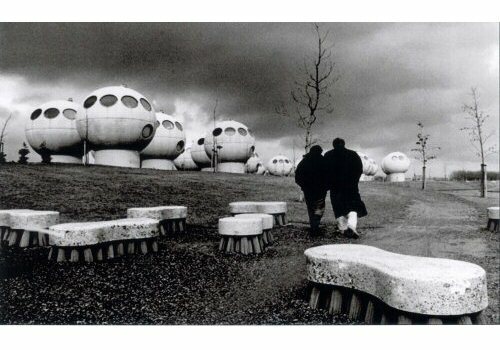 Given the economy at the time, the only people who could really afford them were dessicated middle age managers of British rock stars and Saudi oil emirs. 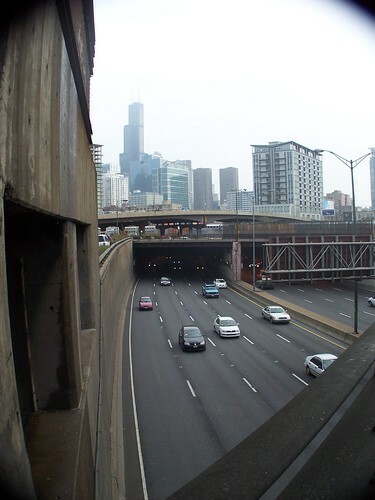 It's somewhat astonishingly cool seeing one used as a daily driver - without garage, in Chicago. This one is a rare lefthand drive, so it was obviously made for export. Just as we were packing up the camera, another square 4 door luxo classic from the 70s rolls by: a Caprice box sporting 24s. Phat! With that we headed to our next stop... college. Couple of Fridays ago Tammi Jo and I had some errands to run around Chicago, including checking out some colleges for 16-year old Hawkette. (yipes!). So we yanked her out of school and set about our city bidness with good buddy / artist Tim Anderson. First stop: Ace Motorcycle and Scooter on Jackson Boulevard. 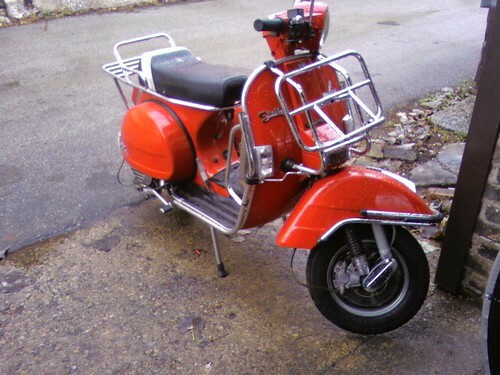 In addition to hot rods, the wife and I are also into old Italian scoots. Spare me the jokes, I've heard all of them; but I can tell you from experience that a sleek Vespa attracts a hotter class of woman than any full-dress Harley. More on that theory later. Anyhoo, we recently made scooter-for-painting swap with Tim. We loaded Tammi Jo's Vespa on the truck to drop at his studio. My '63 Lambretta Li 150 Special has been having magneto issues so Tim suggested bringing it along to drop off at Ace for a looksee and an electronic ignition upgrade. 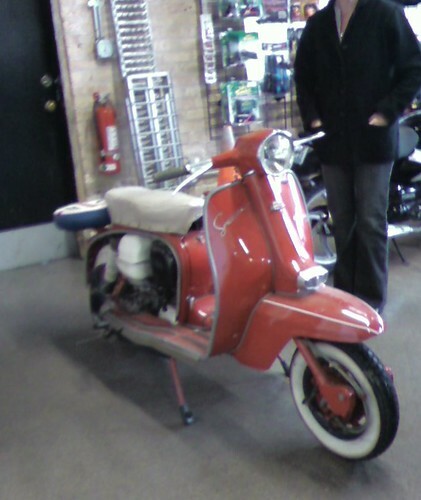 Glad we did because the shop was full of swanky old cycles and scoots like this Vespa SS. My Lambo, ready for the doctor's examination. 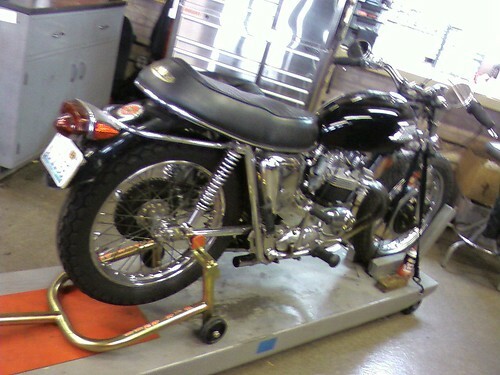 One of my fave stock bikes of all time -- Bonneville T120. 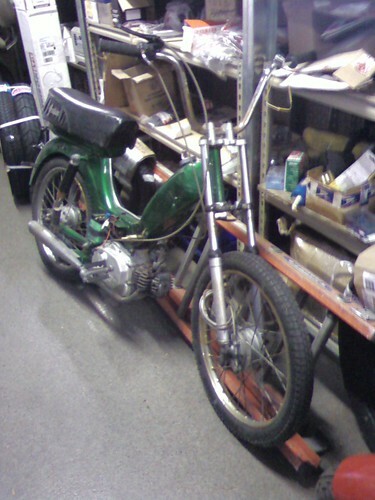 Rad little moped, think it was a Puch. 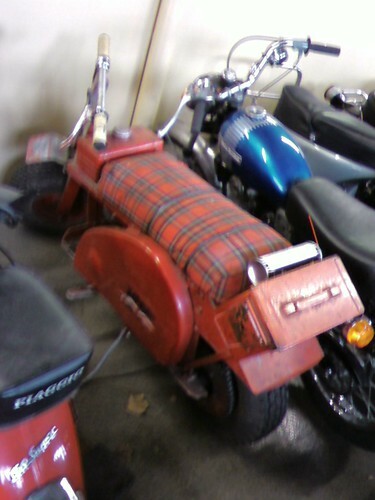 This cool oddball little mutt with the tartan blanket, I couldn't ID. Sort of a cross between a Lark minibike, a Cushman, and a Tibetan Yak. 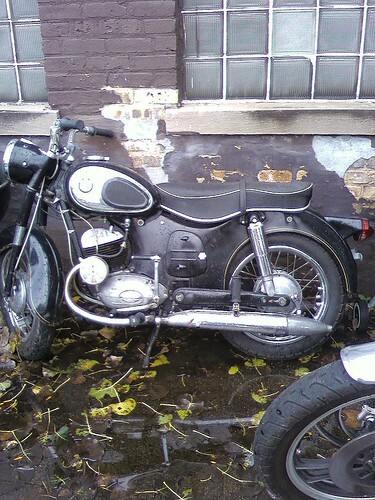 Outside: looks like a vintage 80s Vespa, but is actually a late model Indian-made 4-stroke Stella, base on the earlier Vespa design. 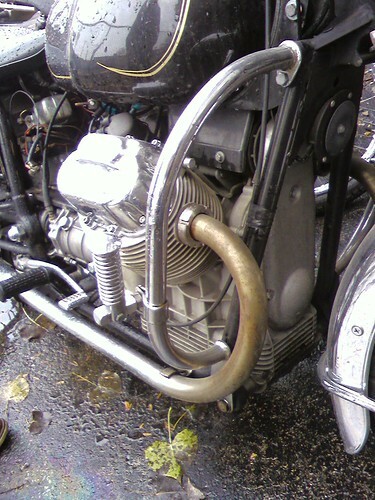 Moto Guzzi! 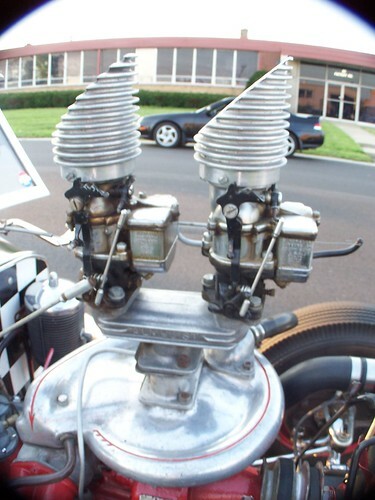 Love them cool tranverse V-twins. 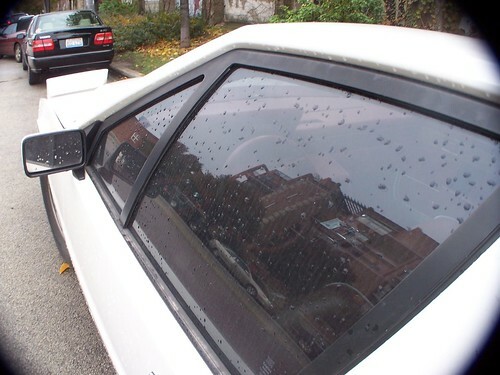 A BMW Allstate. Yup, Germany's "Ultimate Driving Machine" company made its U.S. beachhead by selling little motorcycles through the Sears catalog. 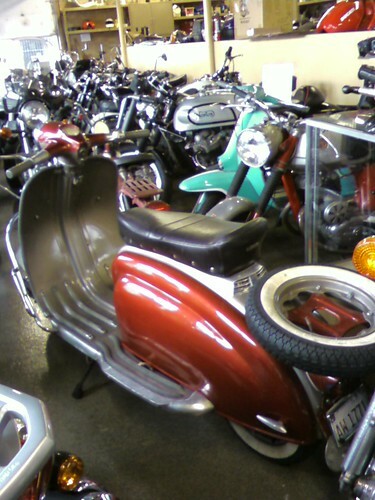 Other makes that wore the Sears "Allstate" co-brand included Cushman, Vespa and Motobecane. 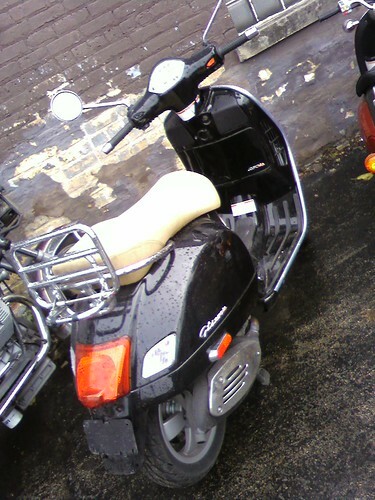 Lest you think motorscooters are for dandylads and shrinking violets, try this on for size: a Vespa GT250, which can hit 95 mph with ease. 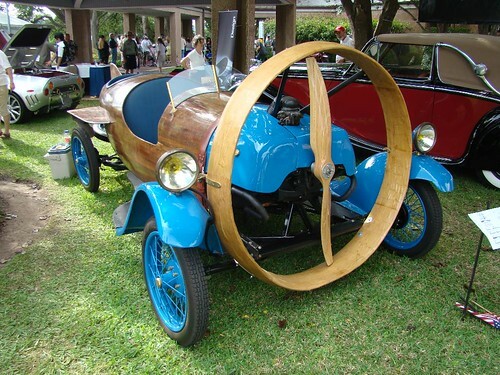 Consider what that feels like on 14" wheels. Daylight's burning! On to our next stop... in Part 2. 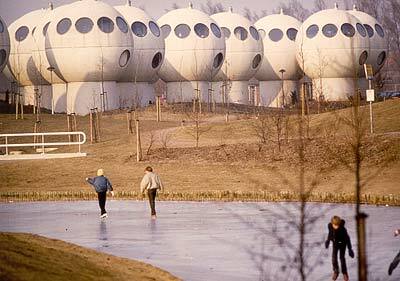 The Bolwoningen golf-ball-shaped buildings are an early-80s housing project reminicent of the previously featured “Kubuswoning” cube-housing. 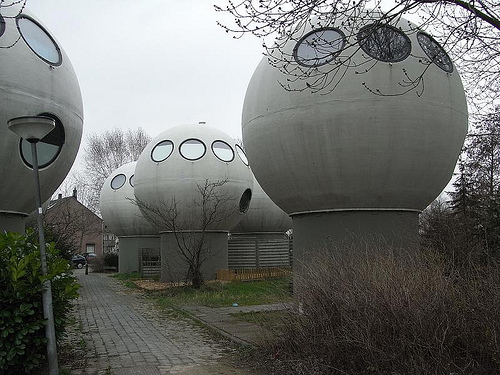 The stupendously-ugly (and presumably incredibly impractical) homes were designed in the late 70s by an architect going by the name of Dries Kreijkamp. Mr. Kreijkamp doesn’t seem to have done much else of note during his career, and by the sound of things, was a little obsessed with his balls. 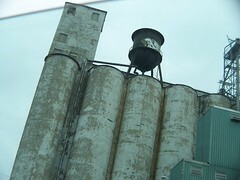 All of which begs the question, what is the ugliest building you’ve ever seen? An assessment I feel is overly harsh. 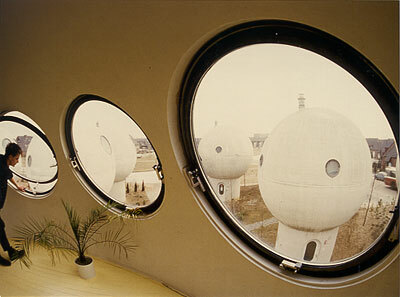 Hell yeah, I'd live in one of these scrubbing bubbles! 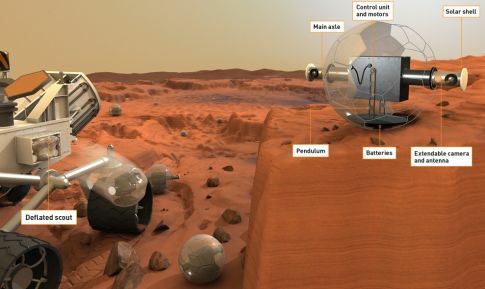 From Cap'n Victory: inflatable Martian surveillance balls! Back in August Kevin and Chad at Hot Rod Chassis & Cycle hosted a little midweek get-together at the shop for the benefit of a film crew from The Learning Channel. The shop's loyal gal Friday "Megabeth" was the featured makeoveree on a episode of TLC's "What Not To Wear" and the producers wanted a little footage for, I guess, the "before" segment of the program. Here's Megabeth and friends with the WNTW crew and a kickass Olds custom coupe. But basic cable, schmasic cable. 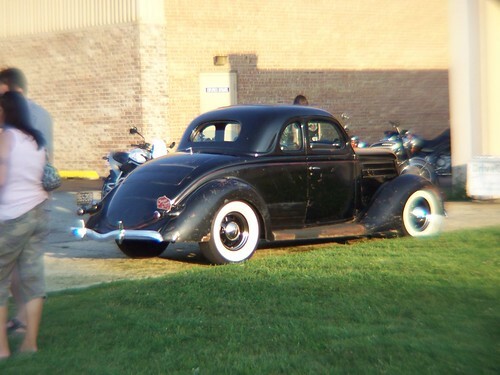 The real reason I was there was for the free beer and bitchin' hot rods, like Chad's '36 5 window Coupe. Inside the shop, an in-progress '27 turtledeck T roadster with a 429 Caddy mill. 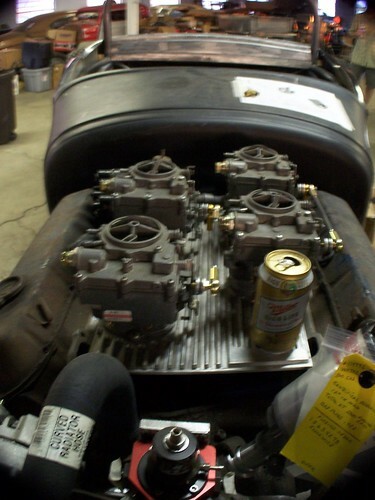 The Caddy huffs 4 two barrels and a Miller High Life through Kevin's homemade manifold. This 360 horse Mercury Marauder 390 occupies a mid 50's F-100 project at the shop. 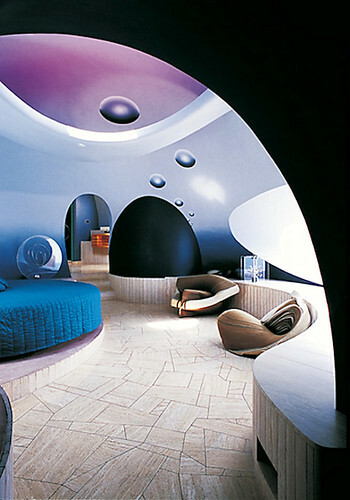 Yowza! 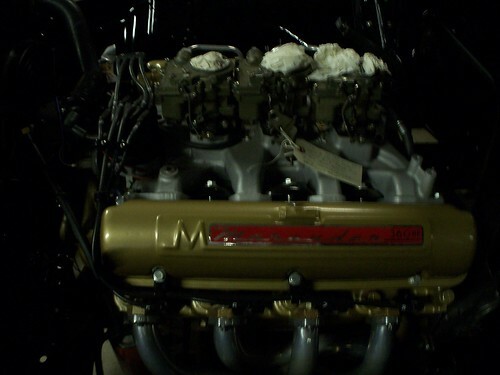 8 pack of Stromberg 97s atop a Mooneyham 8-71 blower. 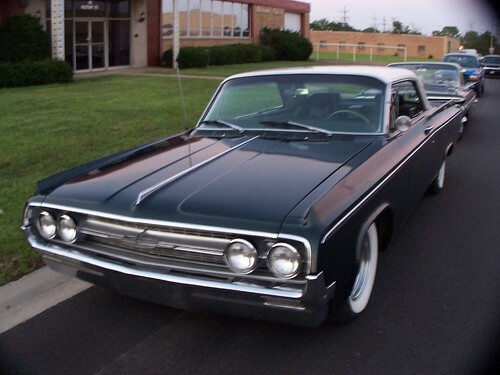 A highly underappreciated beauty -- '64 Olds Starfire. 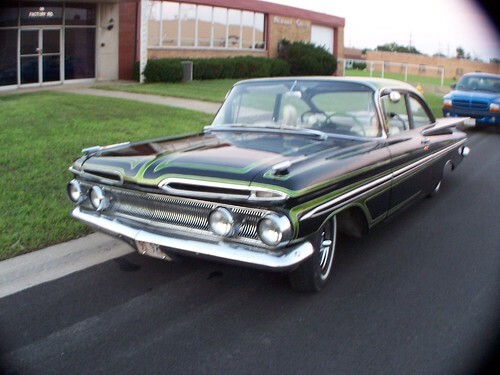 Joe's scalloped '59 Biscayne runs a 1960 Mercury grille. Couple of murdercycles were there too. 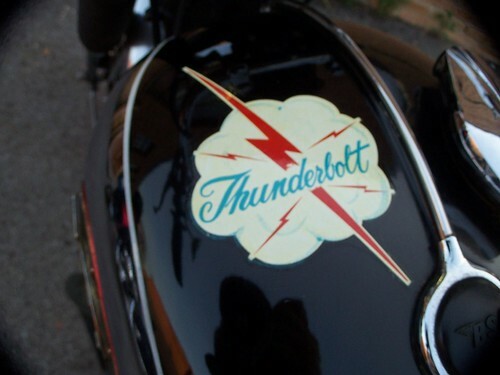 Loved this little nose art on a hog tank. 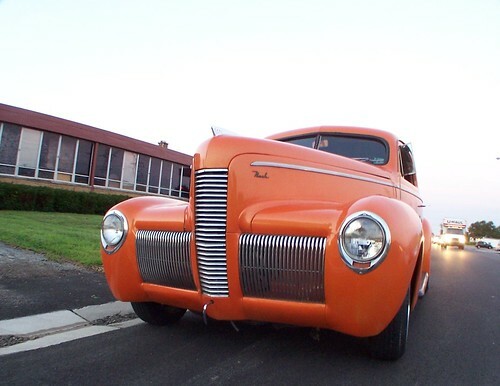 One of my favorite area jalopies, owned by Josh Zartman. 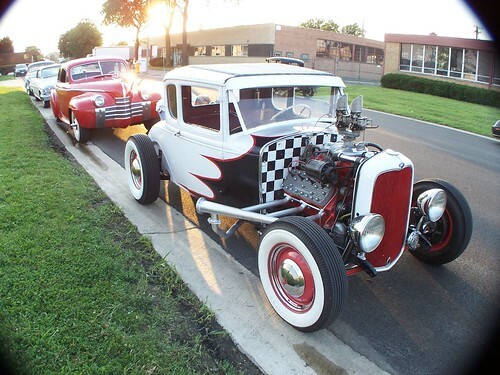 Josh makes his living restoring vintage carbs and is a stickler for cool early hot rod details. 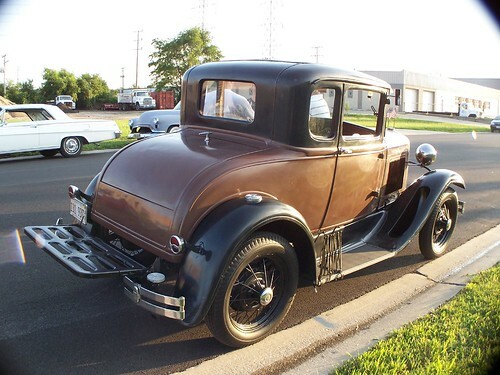 He's had this flatty-powered '31 A Deluxe Coupe on the road for 8 years in this configuration. 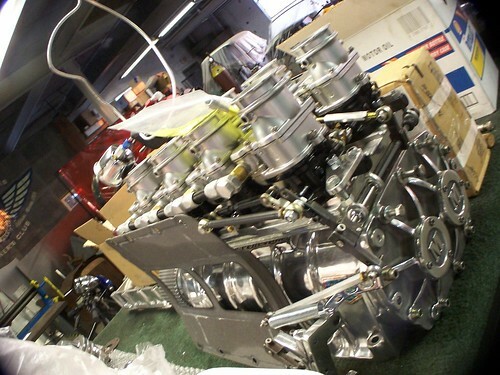 One of the coolest intakes I've ever seen -- behive scoops, 97's, Almquist splitter, all atop a crazy-rare McCullough pancake supercharger. 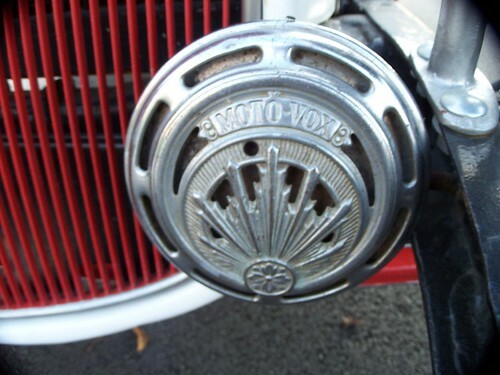 Even the horn rocks... a vintage "Moto Vox"
Josh is a WWII history and aviation buff, as is evident by the Army Air Corps horn button and a shift knob made from a .50 caliber cartridge. 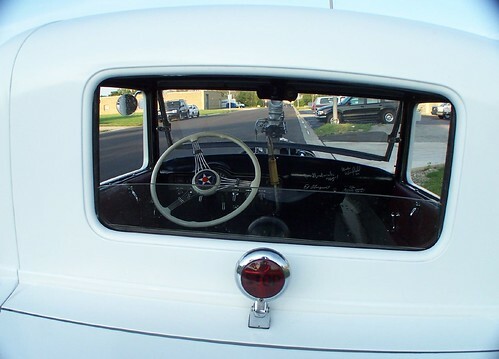 But I think my favorite heap at the party belonged to Josh's dad Greg -- a flat out stock '30 Model A Deluxe Coupe. No need for a makeover here. Another shot of the Helicron from Bob Lacy, who writes: "Damn, Jim Reid must have been standing right behind me at the same show." 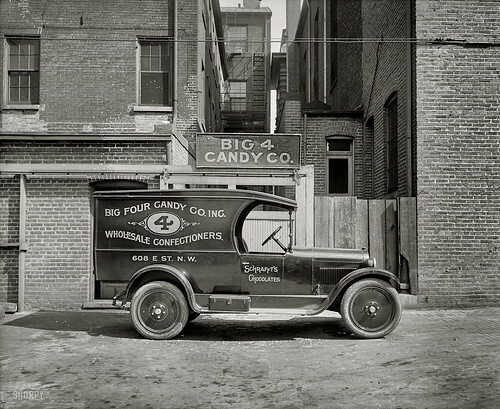 Spotted by Coop at Shorpy: Dodge Brothers candy wagon.